It’s that time of year again, the start of Iron Viz season. The first of three feeders into the Iron Viz Championship is underway. This first contest requires that you use data from Wikipedia. Excited to enter, I scoured Wikipedia for a suitable dataset. I knew I wanted to use a dataset that had broad appeal and had an aspect of virality to it. My first idea was to build a viz about memes, specifically famous cats like Grumpy Cat, Lil Bub, and Nyan Cat. Unfortunately, I wasn’t able to find a good ‘dataset’ to associate with them. 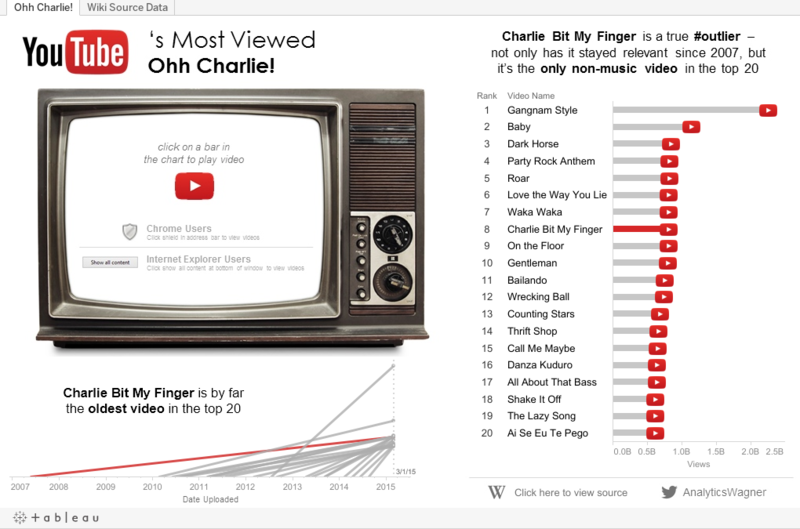 Sticking to the viral theme, I found a great list of the most viewed YouTube videos to use for my viz. There has been a lot of press recently about Psy’s Gangnam Style video “breaking” YouTube’s view counter; it’s had over two billion views – the max 32-bit integer, which is what the counter is built on, is 2,147,483,647. According to the Wikipedia source data, as of March 1st, 2015, Gangnam Style had 2,258,848,834 views. This view count makes Gangnam Style an #outlier, with almost 2x the views of #2 Baby by Justin Bieber. That could have been the focus of my viz but it feels like that story has played itself out. Analyzing the dataset, there was something more interesting in the data that I wanted to focus my viz on. It’s that Charlie Bit My Finger, which was uploaded almost eight years ago, is the 8th ranked video. Also, it’s the only non-music video in the top twenty. It’s pretty remarkable that the video has had such longevity and virality. However, having seen the video, it’s not surprising that it’s #8. It has key ingredients which make it perfect for a viral hit: a baby, it’s cute, and it’s short. These things make Charlie Bit My Finger, the true #outlier out of the top twenty most viewed YouTube videos. Explore the viz. Click on a bar in the bar chart to view the video in the TV. Tip: IE/Chrome see the YouTube embed as an unsafe script, so you’ll need to either click the shield in the upper right (Chrome) or prompt at the bottom of the page (IE) in order to get the video to play (these show up after you click on the bar.) Also, Vevo videos (which make up a majority of the list) won’t play when embedded. The line chart at the bottom of the viz shows when a video was uploaded and the total number of views it had on March 1st, 2015. It’s an attempt to show the avg. views per day and how fast a video reached the top twenty.